José Félix Arriezu grew up surrounded by grapes and wine estates in San Adrian. In 1989 he started to make his own wine to sell in bulk which eventually led to the creation of his own brand label. Jose Felix studied viticulture and enology and gained years of valuable experience in the wine business before embarking on his own project. Arriezo focuses on a limited portfolio of authentic regional wines that are fruity, fresh, authentic and organic. In the glass the wine is bright with light green highlights. The nose has a medium intensity varietal character; white fruit notes of apple and pear with herb notes of fennel and aniseed. The palate is fresh, but also has some roundness to compliment the lively acidity and citrusy mineral notes. This is such a versatile food wine and pairs incredible well with dishes containing fresh herbs, salads and tacos. 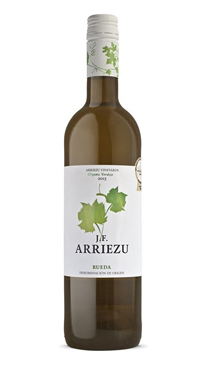 The JF Arriezo Rueda Verdejo 2017 is a superb Spanish white from the Rueda region of Northern Spain. 100% Verdejo and grown organically. The soil in this region is rich in limestone, quite rocky and the region receives optimal sun exposure. Grapes are harvested at night to prevent oxidation and to help retain acidity and freshness. Fermented in stainless steel. In the glass: intense colour with green highlights, clean and bright. Pronounced aromatics of white fruit and a hint of stone fruit. On the palate the fruit carries with the addition of a slight herbal note of anise or fennel. The strong minerality and well balanced acidity brings a wonderful freshness to the wine. Enjoy with seafood, fish and lighter dishes such as salad or vegetables.